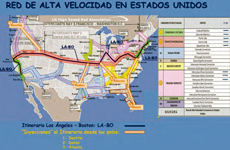 This paper describes a Spanish proposal of possible collaboration with the Federal Railway Administration of the USA Transport Department for the operating in a term of 15 years of the HSR way Los Angeles (CA)-Boston (MA), 3.626 mile (5.834 km) length, that vertebrate the USA High Speed Railway System “USHSRS”, 17.000 mile (more of 27.000 km) length, launched in 2009 by the President Obama, and to date, only in execution some sections of the CHSRA (California High–Speed Railway Authority), 200 km hardly, in the Californian Central Valley, around Fresno. In the construction of these sections take part Spanish companies of high level in wined bids provided the Spain’s privileged international consideration for the development and high technology of its highspeed railway network (AVE), the second in the world by length, after China. This itinerary is integrated by the Structural Units: “Ia:- Pacific Coastal Corridor”, “II: Intercoasts Way” and “Ib:– Atlantic Coastal Corridor”, as collect in the Table “Taking off & Summary” about Characteristic figures: morphological, structural and budgetary, from predesigned HSR Lines by the authors of this paper in the “Farwest”, “Canevar”, “Nevut”, “Utconmar”, “Interplains”, “Ohio-Potomac” and “Chesa-Hudsanan-Charles” Projects. The Construction Budget is 112.175 M$, with an unit cost of 19,30 M$/km. Finally is summarized an operation study of this itinerary with fourteen stations and the two Terminals, from which would depart trains each forty minutes (18h/day) by direction, respectively, with twenty carriages (eleven sitting cars and nine sleeping cars) in a similar composition to the used in the Berlin-Moscow express railway since 2016 December 17. In a graph is summarized also the distances between stations, times of travel (with stops between) and foreseen ticket rates with loans at 6% for a total investment financing (infrastructure, superstructure, equipments, signaling and rolling stock).